Chop all vegetables. Slice pork fillet thinly. Cook the noodles per packet instructions, drain, rinse and set aside. In a frying pan or wok, over medium heat, fry the oil, sesame seeds, chilli, ginger, coriander and pork. Mix well, cooking 3-5 minutes. Add the chopped vegetables and mix well. After 3-4 minutes, and the fish sauce, stock and lime juice. Stir to combine and simmer until vegetables are tender. 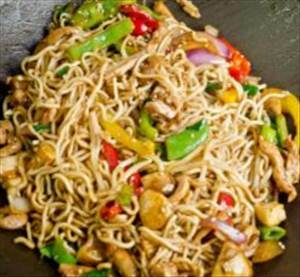 Once vegetables are ready, add the noodles to the pan combining well. Add a little pepper or more chilli to taste. There are 426 calories in 1 serving of Sesame Pork Noodles. Calorie Breakdown: 23% fat, 44% carbs, 33% prot.